CADE. family details in Grewelthorpe area. The following information tasken from census records. ANN CADE. Born C. 1878 Grewelthorpe. Dau of George of Murton & Martha Moore. BESSIE CADE. Born C. 1876 Grewelthorpe. Dau of George of Murton & Martha Moore. ESH CADE. Born C.1810 Haxby. Son of Robert & Sarah Esh. Husband of Harriet Young. of Deighton. Father of George of Murton. FRED CADE. Born C. 1895 Grewelthorpe. .Grandchild of George & Martha Moore. Son of Elizabeth [possibly Thirkill] See photo at end. Had son George. In 1911 a servant in Melmerby. GEORGE CADE. Born C. 1839 Murton. Son of Esh & Harriet Young. Ag Labourer. First recorded in Grewelthorpe in 1881 census. Married to Martha Moore. from Grewelthorpe in 1871. His eldest child John was born in Grewelthorpe about 1872. So probably living there then. HARRIET CADE [nee ?]. Born C. 1808 Deighton. Wife of Esh of Haxby. HARRIET CADE. Born C. 1874 Grewelthorpe. Dau of George of Murton & Martha Moore. Servant in Masham in 1901. JANE CADE. Born C. 1886 Grewelthorpe. Dau of George of Murton & Martha Moore. JOHN CADE. Born C. 1872 Grewelthorpe. Son of George of Murton & Martha Moore. Farm servant in Low Ellington in 1891. In Aldborough in 1901. MARGARET CADE. Born C. 1884 Grewelthorpe. Dau of George of Murton & Martha Moore. MARTHA CADE [nee MOORE]. Born 1842 Grewelthorpe. Wife of George of Murton. Dau of William & Thomasin Moore. see Moore family page. MARY CADE. Born C. 1880 Grewelthorpe. Dau of George of Murton & Martha Moore. ROBERT CADE. Born 1 Aug 1765 Osbaldwick. Died Dec 1838. Son of Robert & Jane Milner. Married Sarah Esh in 1790. ROBERT ESH CADE See under ESH Cade. ROBERT CADE. Born C. 1881 Grewelthorpe. Son of George of Murton & Martha Moore. Cowman at Park House Farm, Knayton in 1901. WALTER CADE. Born C. 1900 Grewelthorpe. Grandchild of George & Martha Moore. WILLIAM CADE. Born C. 1888 Grewelthorpe. Son of George of Murton & Martha Moore. 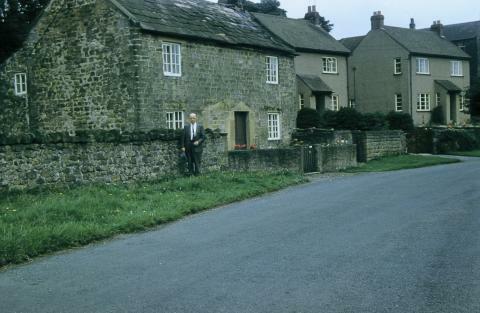 Fred Cade outside his birthplace in Grewelthorpe. Photo taken 1960. If you can add any information to this page please contact me. Researched by B.Bradley Updated Jan 2011.